One of the best known Roald Dahl books is getting a musical adaptation coming to Milton Keynes Theatre. Fantastic Mr Fox runs from Tuesday March 7 to Saturday March 11 at the venue. Boggis, Bunce and Bean, three greedy, smelly, horrid farmers hate the cunning Mr Fox. Mr Fox is smart, clever and rather fantastic, but he doesn’t realise how determined the farmers are to get revenge. Can he hatch a plan to save his family and friends? Can they outrun the diggers and outsmart the farmers, and can rabbit shut up long enough not to give the game away? It is a juicy tale of greed, pride and the power of friendship, this flagship production for the Roald Dahl centenary celebrations, promises a dahlicious theatrical feast with live music and songs and gloriumptious designs. The book was first published in 1970 and is one of many famous books written by the Welsh author who would be 100 were he alive today. Adding writing to his bow, Doctor Who and Broadchurch actor Arthur Darvill has put down the scripts and picked up some instruments to write the songs for the musical. He is best known for playing Rory Williams in the sci-fi drama and Rev Paul Coates in the ITV crime show about to return for its third series. 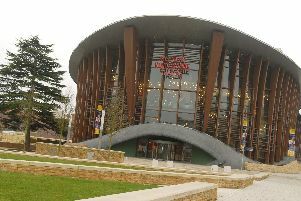 The show comes to Milton Keynes as part of a UK wide tour which started in Southampton over the Christmas period. Playing the title role is Greg Barnett who’s previous work includes Swallows and Amazons, Zorro, Peter Pan, Twelfth Night and Sweeney Todd in both WestEnd and touring productions. For further information or to book tickets in advance call the box office on 0844 871 7652 or visit www.atgtickets.co.uk/miltonkeynes.